True to the Mafi philosophy on nature and healthy living, Mafi endeavours to provide only all-natural finished surfaces without compromise of quality. Mafi boards come pre-finished in either a sanded or brushed surface and an all-natural oil. The Mafi oil penetrates the woods pores and as it hardens the surface becomes extremely hardwearing whilst allowing the woods pores to remain open and breathable. 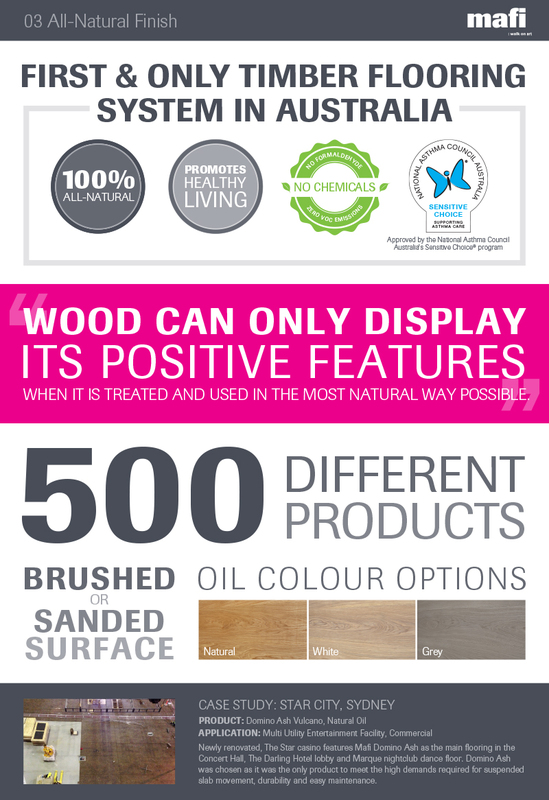 These unique qualities of an all-natural finish ensures Mafi timber boards are suitable for heavily frequented domestic and commercial areas, as well as over under floor heating and in bathrooms. Mafi oil is 100% all-natural and free from harmful substances and cleavage products like solvents, biocides, formaldehyde and turpentine. Mafi oil is available in 3 different varieties: natural, white and grey. Each oil enhances the natural appearance of the wood, as well as creating a finish custom to your liking.